You want to eat fish because it's good for you, but when your salmon piccata leaves behind a stench, it's not so appetizing. Even if you love fish, actually cooking it in your kitchen can be a commitment. Long after the fish has been eaten, the pots washed, and the plates put in the dishwasher, the fish smell lingers. It can be enough to put even the most devoted fish eater off cooking it regularly. And it definitely isn’t something that you want your guests to notice, which means that menu planning for a dinner party is just that much tougher. Luckily, expert cooks from around the Internet have figured out how you can cook your fish without leaving behind a stench that lingers for days. First off, know that truly fresh fish really shouldn’t have much of an odor at all. So if you unwrap a package of fish and take a step back from the smell that greets you, toss it because it’s not fresh. But, admittedly, even the freshest fish can get a bit of stink going in your house once it’s cooked. A lot of the smell from cooking fish is because of the cooking method that you use. How to get rid of fishy smell starts by changing the way you’re cooking your fish. Frying can cause a massive odor problem, but other techniques, like cooking fish in foil or paper, can put a lid on the problem before it starts. Cleaning experts recommend neutralizing the odor before cooking by soaking fish in milk or a solution of lemon and water. If it’s too late and your home is beginning to smell like the parking lot of a seafood joint, then Good Housekeeping suggests mixing together vinegar and water and letting it boil for several minutes for how to get rid of fishy smell. You can also add cinnamon sticks or lavender oils for a more pleasantly scented atmosphere. 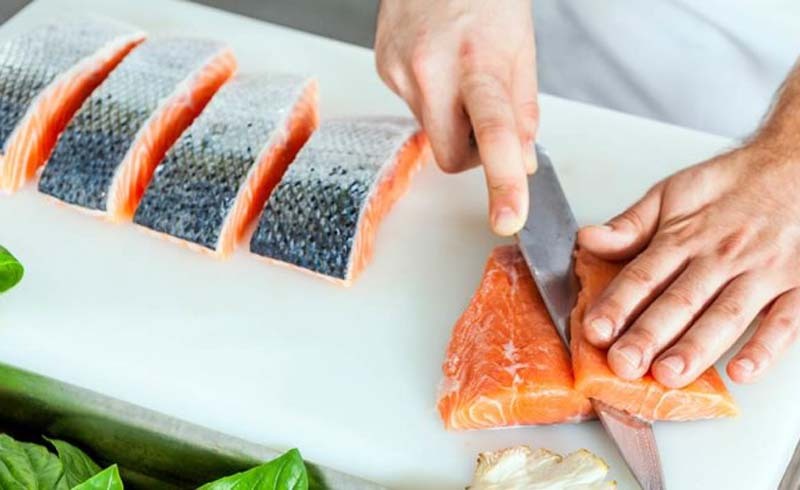 Prep your home ahead of fish cooking time by shutting any inside doors to keep the smell from spreading throughout the house and into bedrooms, but open up kitchen windows and doors to allow the smell to ventilate. And be sure to wipe any spills and toss any trash containing fish bits as soon as possible to help prevent any lingering odors. When all else fails, bake up some cookies for dessert and the resulting sweet scent will make everyone forget about any fishy odor.